ISBN 0793596637. 9x12 inches. Various Artists. Essential for all drummers, this collection includes transcriptions of fantastic standards performed by legendary jazz drummers: Billy Boy (Philly Joe Jones) • Delilah Dances (Delilah) (Max Roach) • Fly Me to the Moon (Roy Haynes) • If I Should Lose You (Roy Haynes) • Israel (Paul Motian) • It's Only a Paper Moon (Art Blakey) • Seven Steps to Heaven (Tony Williams) • Softly as in a Morning Sunrise (Elvin Jones) • The Surrey with the Fringe on Top (Philly Joe Jones) • Take Five (Joe Morello). 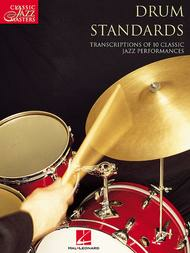 In addition to the solos and drum breaks, this book includes transcriptions of their playing on the “heads” of the tunes, providing insight into their mastery of form and structure. Includes notes on each song, as well as info about the recordings.